Microdermabrasion to exfoliate the skin to minimize pores and reduce breakouts. Designed for acne, oily skin and enlarged pores. DermaTx Advanced Skincare brings you the benefits of microdermabrasion by introducing its new range of microcrystal cosmeceutical creams for use in the comfort of your own home. Brighten (with SABIWHITE®) – Designed for uneven skin tone, sun-damaged and ageing skin. 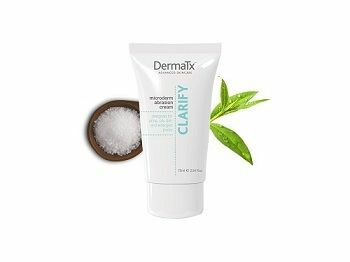 Clarify (with 2% Salicylic acid) – Designed for acne, oily skin and enlarged pores. Rejuvenate (with Antioxidants) – Designed for normal to sensitive skin. The treatment creams contain professional grade corundum (aluminium oxide) crystals – the same as those used in microdermabrasion machines used in dermatology clinics – for exceptional skin resurfacing results but at a fraction of the cost of just one clinic treatment. Once the dead cells are removed, the active ingredients found in the specifically designed creams can go deep into the newly revealed skin to effectively target the problems being addressed and to help eliminate imperfections. Achieving smoother, younger-looking skin in the comfort of your home has never been easier! Clarify Microdermabrasion Cream contains professional grade corundum crystals, as used in salon microdermabrasion machines for exceptional skin resurfacing results. After debris and surface oil is removed, the anti-bacterial and anti-inflammatory ingredients help clarify skin and reduce inflammation to heal and discourage further breakouts. 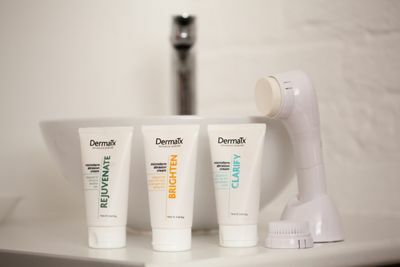 Frequent use of the DermaTx Clarify system helps to restore the skin to a healthy function and diminishes the appearance of imperfections on the surface. In just 4 weeks a more beautiful complexion can be yours! Caution: Not suitable for sensitive skin types. Do not use if you have an allergy to aspirin, are pregnant or breast feeding. Do not use on Rosacea, active Acne, Open Sores, irritated skin or other dermatology skin conditions. Do not use following chemical peeling or retinol. Directions: Apply a small amount of cream to clean moistened face (forehead, cheeks, chin and nose) lightly massage into skin using circular motions with either your fingers or with a DermaTool for approximately 2 minutes. Rinse off the remaining crystals residue with warm water. Dry face and apply moisturiser then sunscreen. Use 2 or 3 times a week. 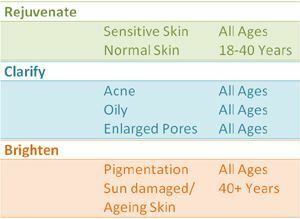 Why use a DermaTool for application? 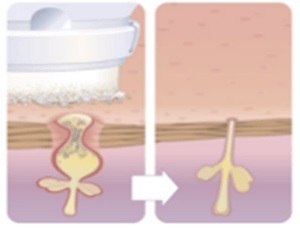 When the DermaTx Microdermbrasion cream is applied to the specially designed foam attachment the crystals become embedded in the "micro-pores" of the foam. This ensures that the crystals will haven even movement over the surface of the skin and will be utilized to their maximum refining capabilities. Micro-massaging of the corundum crystals in DermaTx Microdermabrasion Creams provides a superior microdermabrasion treatment, and allows the ingredients to penetrate deeper into the skin. Alumina, Aqua (Water), Paraffinum Liquidum (Mineral Oil), Glyceryl Stearate SE, Salicylic Acid, Caprylic/Capric Triglyceride, PEG-8, Saccharide Isomerate, Sodium Ascorbyl Phosphate, Phenoxyethanol, Cera Alba (Beeswax), Stearyl Alcohol, Cetyl Alcohol, Tocopheryl Acetate, Sodium Hydroxide, Taraktogenos Kurzii (Chaulmoogra Oil), Xanthan Gum, Melaleuca Alternifolia (Tea Tree) Leaf Oil, Magnesium Aluminum Silicate, Leptospermum Scoparium (Manuka Oil), Palm Glycerides, Capryloyl Glycine, Potassium Lauroyl Wheat Amino Acids, Nigella Sativa Seed Oil, Ethylhexylglycerin, Sodium Lauryl Sulfate, BHT, Retinyl Palmitate, Magnolia Grandiflora (Magnolia Bark) Extract, Laminaria Ochroleuca Extract, Citric Acid, Sodium Citrate, Maltodextrin, Beta Glucan, CI 77891, Tocopherol.